Ibrahim (Ebrahim) Sharif is the General Secretary of the secular liberal National Democratic Action Society, also known as Wa’ad. Sharif was one of the first opposition leaders to join the protests in February 2011. He consistently emphasized the universality of the protestors’ demands, eschewing sectarianism and calling for a constitutional monarchy. A Sunni Muslim and longtime member of the secular opposition in Bahrain, Sharif opposed government claims that protesters were motivated by a sectarian agenda. 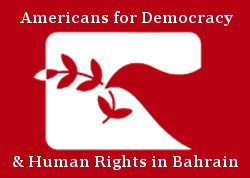 Sharif took an early role in the Pearl Square protests, joining protesters in calling for human rights, dignity, and democracy for the people of Bahrain. The Bahraini government responded to these protests by surrounding Sharif’s home with 40 masked men, several of them armed, and taking him away at gunpoint at around 2:00 am the morning of March 17, 2011. After his arrest, government security forces subjected Sharif to torture and ill-treatment before finally interrogating him five days later. Sharif was sentenced to five years in prison on June 22, 2011, and the appeals courts upheld the ruling, even after receiving confirmation that the evidence against him was obtained through torture. 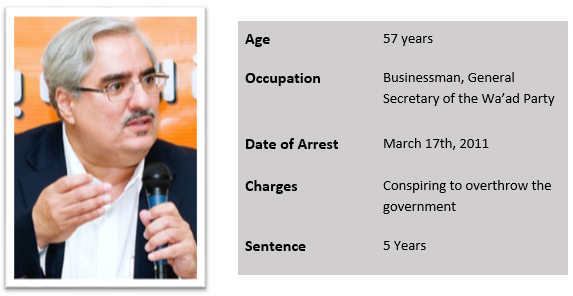 In July 2014, the Government of Bahrain demanded that Wa’ad select a new Secretary General to replace Ibrahim Sharif, a clear breach of the democratic process. The society’s Acting Secretary general refused the demand. Stay tuned for actions you can take this month to advocate on behalf of Ibrahim Sharif and other political prisoners in Bahrain. A pdf of this profile is available here.